In case you’re living under a rock, but also have a computer and internet connection, and didn’t watch it, Drew Brees is Superbowl XLIV (44th) MVP, bringing the New Orleans Saints victory and the Vince Lombardi Trophy. 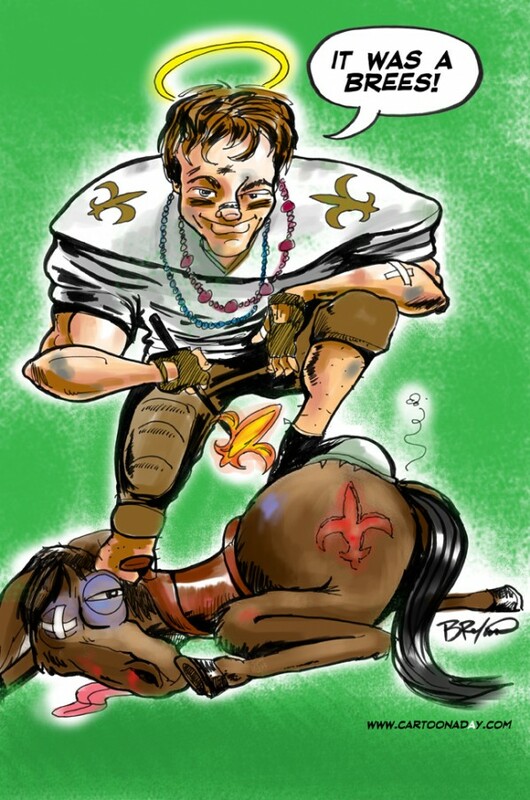 Here he is as a ’saint’ branding a beaten colt. I’m not a fan of animal cruelty folks, having 4 dogs, 2 cats and kids…it’s just a cartoon using their Mascot. Describe how badly Drew and the Saints beat up the Indianapolis Colts in the Super Bowl. Inspiration: Super Bowl 44 and Drew Brees' MVP performance as quarterback.